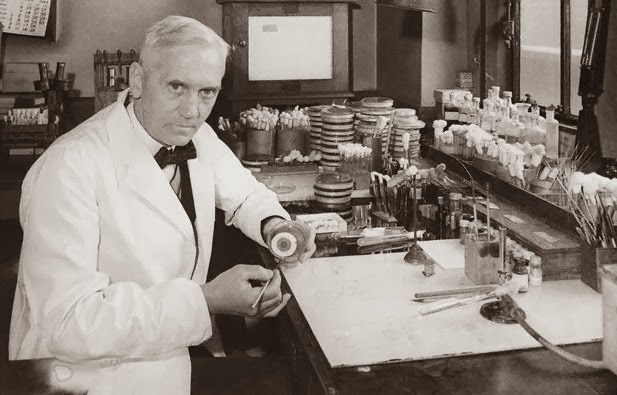 85 years ago, Mr Alexander Fleming discovered a little something called...Penicillin. Heard of it? You probably should have by now. If it wasn't for Mr Fleming's discovery, many of us today may not be alive. This week I have been home sick. It hasn't been fun. Being home from work seems like a great idea but it pushes everything back. When you can't get out of bed or do the things you usually love to do, you start feeling hopeless. It also doesn't help when everyone around you seems to be having such a marvellous week from weddings, to engagements, to employment, to holidays, to just being able to go the beach. Stephen reminded me something though. To be grateful for the blessings I have or even more importantly the blessings that have been given to other people. Mr Fleming here was blessed with knowledge and intelligence great enough to discover penicillin which saved the lives of thousands. I thank God for him and his blessing. He probably spent many days sick at home, or saw many people fall away to illness, especially during the war. He probably had the worst weeks ever - much worse than me. But he pushed on, he kept going and thanks to his perseverance and fortunate luck, he discovered that little penicillin mould growing in that petri dish. I am grateful today for all the blessings that other people have been given. I am grateful for all the people who have helped change and heal the world. What a miracle these blessings are. It is amazing when you think back to some of the accomplishments that others have had. It's a great thing to be humble and grateful too, somethings that is lacking nowadays it seems. I'd have to be grateful to my parents - came from no money in China and moved us all out to Vancouver where they built a home and a life for all of us three kids. Knowing how hard it is to buy a home these days, you really do have to admire them for working so hard for us. Wow that is a wonderful story about your parents. It's ridiculous when you think of the extent to which the antibiotic revolution has changed our world. The number of diseases that are now entirely trivial that in years gone by were mass murderers. A truly great thing to be thankful to the Lord for! It is so humbling isn't it! I constantly forget and constantly have to remind myself of how lucky I am to have the simplest things in life. You're right when you say it's overwhelming. i love how real and substantial this post is. hooray! I just found your blog too. I love it!